The book is a mock-self-help, with 15 lessons which Rachna learnt or which she wants us to give serious thought to on a good-humored day. It is about men, women and children, but mostly about them together in one tea cup, stirred while juggling their roles and messing Rachna’s seldom-combed hair. Her imagination is wild, but this is clearly her real life and so candidly shown you would wonder if your family would cook you if you threw open your house’s back door for a ‘comical view of life from a woman’s perspective’. She has done exactly that, in an organized and fair manner. Organised because the chapters (Lessons) follow a neat chronology of homely phases of evolution – dating to diapers to denial (about age, you know). And fair, because she’s not lampooning just men but boys all ages! For some of us marriage happens. As suddenly there are men growing out of our couches. The husband variety is a particularly interesting species. Lesson 1 itself tells you that ‘You will learn that real men really forget’, but when women dig mushy memories they ‘insist that the recall and recall alone is evidence of true love’. Why shouldn’t they? Men, however, with an ‘inner mind … operated via a TV remote’ never meet our memorable expectations! All roles that men have to play are important. But none as much as the one ‘to record your performance on the video camera’ during the society celebrations for Independence Day or selection for Teej Queen. Successfully? Not in this book, no. When age sets in for a woman (obviously much later than men!) and she has found her voice, the man at home mutates into 'a casual observer (who) has just woken up and turned up the volume of the cricket match and is, at best, vaguely aware, that there is some blurred silhouette of a mid-to-large-sized female in the corner of his eye. It seems to be saying something.’ No surprise then that our maids and support staff not just help us but ‘are used as role-models during spousal fights’. We can't blame women. Do you know what we go through to bear kids?! ‘Childbirth was not easy! In fact, our first-born, Aisha, was born in extremely alien conditions: at a hospital in Kawasaki in Japan. The only English term those guys knew back then was ‘curry and chutney’ used while ordering ‘curry and chutney’ at any Indian or Pakistani restaurant. And, the only Japanese word we knew was ‘Sayonara’ taught to us by Asha Parekh. Combining the two, one could not do much except have dinner and part: both activities not quite directly relevant to childbirth. The Japanese government was very kind to us and provided us with the services of an interpreter. We were grateful till we read the fine print: we had to pay her by the hour. The thought of it gave both of us severe uterine contractions. In both cases, it turned out to be a false alarm, since I never went into labour, and Alok discovered he didn’t have a uterus. 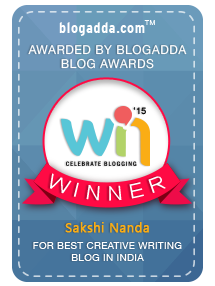 Rachna has a wide array of experiences to share as a parent, and lessons learnt too. Say, how new age parents cannot rely on threats of ‘Budhdha baba’ anymore. Kids know there is no old man out to get them, ‘and the old man you point to is Ram Jethmalani, in conversation with Arnab Goswami. And he is not out to get them. At this age, there are few things he ‘gets’. So, with kids you need to be ready. With new-age treats, with threats, with non-organic vacations and with answers especially for the ‘acid test’ questions, which feature God. Rachna helps. On women, and everything about them! A lot of feminine ground is covered in ‘Dating, Diapers and Denial’. That is, the various issues which beset women at myriad stages of their lives. From keenly observing ‘increased political activity in a group of girls’ during playtime to later in uncannily similar kitty parties, Rachna gives us a peep into social behavior that we see when more than one women are put together in a tea cup, or in a gym. She even shows us the hilarity of being a work-from-home mother. Now if only she had elucidated on the gifts NRIs get for their “poorer cousins” in the third world, I would have stood up on my chair and applauded. That out of the ‘two options, one is to find a good parent role model whom you can emulate or a bad parent contrast against whom you can look very good’, I pick the latter. 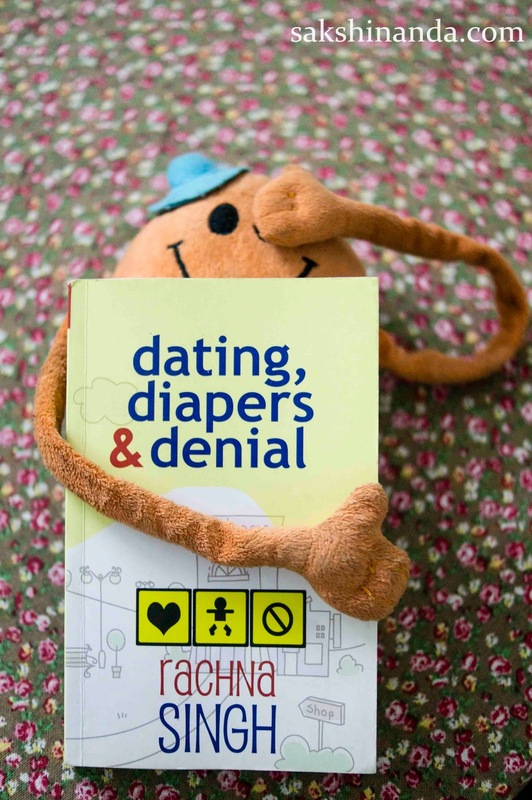 ‘Dating, Diapers and Denial’ is Rachna’s “autobiography” but you realize it is a one-size-fits-all stand-up comedy act about our everyday lives. We women will relate to the anecdotes and enjoy, and men are requested to have a good sense of humour. The humour is warm not dry, and with witticisms delivered with a straight-face and right when you are not expecting them. This was a fun and funny read. 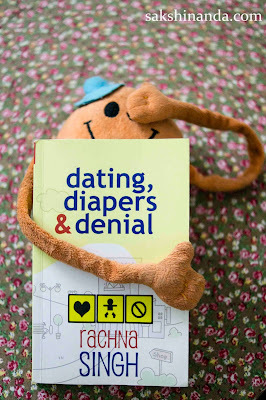 'Dating, Diapers and Denial' by Rachna Singh is published by Alchemy Publishers, 2011. I'm definitely reading this book..the review itself left me in splits..i can imagine what fun the book would be.. The book is more fun than the review. Believe me!